U.S. Sen. Richard Blumenthal announces a new federal gun storage bill outside Guilford Town Hall on Friday. 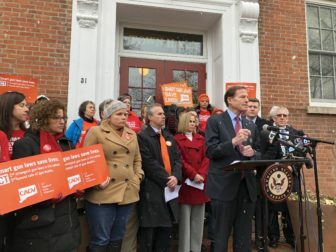 Blumenthal said firearm owners who don’t secure their guns would face a $500 penalty or forfeiture, and a class D felony with up to five years in prison, if the firearm caused any injury or death. U.S. Sen. Chris Murphy is co-sponsoring the bill. The federal law would be largely modeled after the new measure introduced by state Rep. Sean Scanlon, D-Guilford, called “Ethan’s Law.” That law would close a perceived loophole in Connecticut’s current gun storage legislation. Kristin Song speaks at the press conference on Friday. Ethan’s mother, Kristin Song, said gun violence in the U.S. could be reduced dramatically if guns are safely stored and secured. Song said she respects those who own guns and want to protect their loved ones. “Here is the good news, technology has made it possible to keep firearms out of inappropriate hands and permitting quick access to your firearm in the event that you need to protect your loved one or your home—the safes can be opened in a matter of seconds,” Song said. Connecticut Against Gun Violence Executive Director Jeremy Stein said the measure not only helps avert accidental deaths, but would also aid in preventing suicides, school shootings and urban gun violence. Stein held up a National Rifle Association manual that details safe storage steps. 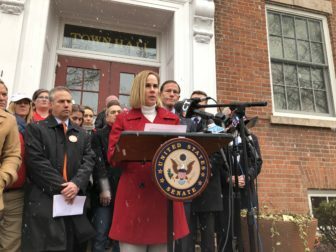 Scanlon, who has sought support for his legislation from the Connecticut Citizens Defense League and Republicans in the Judiciary Committee, said he believes the bill he introduced will have significant bipartisan support. That bill would amend current law to require that all firearms, even those that are unloaded, be stored properly. It would also raise the age of those considered a minor from the age of 16 to 18. Scott Wilson, presiden of the CCDL, said Friday that his organization has some concerns that would need to be addressed during the legislative process before it can support the bill.